Artist's impression of a near-Earth asteroid. A whopper of an asteroid will make a close approach to Earth on April 19. There's no need to panic, though; NASA says it won't collide with our planet. But it will get extremely close for an asteroid of that size. Named 2014 JO25, this giant space rock measures approximately 2,000 feet (650 meters) across — about the height of the Shanghai Tower, China's tallest building and the second-tallest building in the world. It will pass by Earth at a safe distance of 1.1 million miles (1.8 million kilometers), or nearly five times the distance between the Earth and the moon. NASA first learned of 2014 JO25 three years ago, when astronomers monitoring the Catalina Sky Survey at the University of Arizona spotted it with their telescopes. Sponsored by NASA's Near-Earth Object (NEO) Observation Program, the survey searches for potentially Earth-threatening asteroids in the solar system. The asteroid 2014 JO25 will fly within 1.1 million miles (1.8 million kilometers) of Earth during its flyby on April 19, 2017 as seen in this NASA diagram. The asteroid is about 2,000 feet (650 meters) across, NASA says, and poses no impact threat to Earth. While NASA doesn't know much about its physical properties, the agency's NEOWISE (Near-Earth Object Wide-field Infrared Survey Explorer) mission indicates that the asteroid is about twice as reflective as the moon. Skywatchers will be able to see it with a small telescope. After it first becomes visible in the night sky, it will slowly fade into the distance, disappearing after one or two nights. 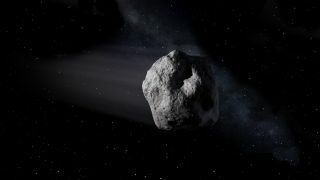 "The April 19 encounter provides an outstanding opportunity to study this asteroid, and astronomers plan to observe it with telescopes around the world to learn as much about it as possible," NASA said in the statement. "Radar observations are planned at NASA's Goldstone Solar System Radar in California and the National Science Foundation’s Arecibo Observatory in Puerto Rico, and the resulting radar images could reveal surface details as small as a few meters." Editor's note: If you capture a photo of asteroid 2014 JO25 through a telescope and would like to share it with Space.com, please send images and comments in to: spacephotos@space.com.